Have you ever had the desire to customize the look of your iPhone, iPad, iPod touch without the need of WinterBoard? If you had you may be glad to know that a new tweak called AlertArtist was just released into Cydia! 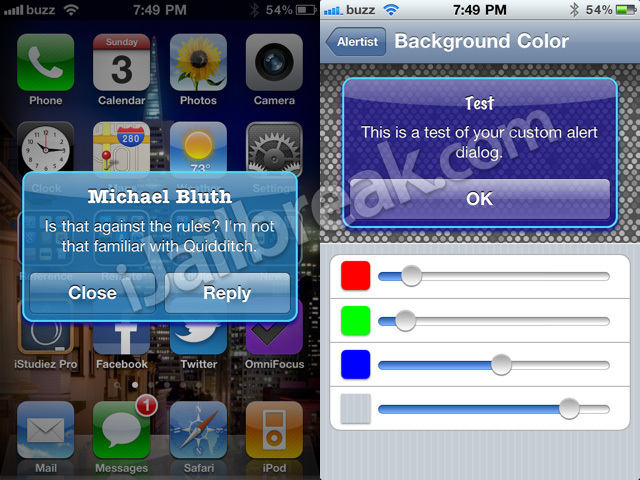 This tweak allows you to customize the appearance of all alert dialogs on your iDevice. You can Choose from a number of included themes, or even create your own theme through an easy to use interface! You can take a look at what is possible with this tweak in the screenshots below (Left: customized dialog box. Right: customization interface). If you are interested in customizing iOS dialog boxes without the need of WinterBoard you can find the AlertArtist tweak through Cydia for a price of $0.99. One of the problems with the iPhone 4 is that not all app icons support Retina display. While this issue is getting better and better by the day I am sure you can think of numerous apps that still have not updated their app icons to be compatible with Retina display. We have actually featured a few different tweaks on our blog that are been able to fix this issue, but I think this next one we are going to talk about is my favourite. Introducing iRetinizeBoot. This tweak runs when you boot your iDevice, checking for new apps that aren’t Retina optimized. While your device is booting it quickly and efficiently iRetinizes ALL of your icons! Once it finishes, it closes the background process so it isn’t running in the background. When your device finishes booting, your icons are iRetinized! 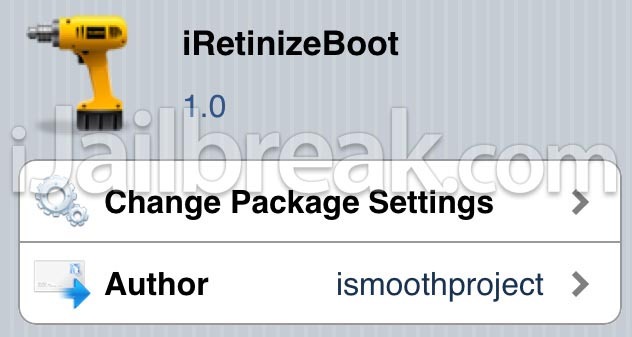 If you are interested in iRetinizeBoot it is available through Cydia for free. Notes: If you have over 100 apps, iRetinizeBoot will finish iRetinizing your app icons, but the last 80 percent might not appear until the next respiring or reboot. This is due to the tweak is still finishing by the time SpringBoard is running. It can also at any time be run on your iDevices terminal. Simply type iRetinizeBoot and it will automatically start iRetinizing your apps for you. If you are looking to clean up your SpringBoard a little, we have found the perfect tweak for you! App Stat was just released into Cydia the last couple days and with this tweak you can find information about the apps you have launch. Such as the Frequency of use, the time you have used a specific app and which apps you have used recently! This will not only help you find out which apps you use most often, but it will help you find apps that are worth deleting off your SpringBoard! If you are interested in App Stat it is available free through Cydia. Remember a couple months ago when we talked about the ManualCorrect tweak? If you need a mental refresher the tweak is a very useful tweak that lets you type without Auto Correct butchering your sentences; it only corrects a word when you tap on the correction. Personally this is one of the tweaks I always install when I jailbreak my iPhone. I think it really improves the typing experience while using any type of iDevice and best of all ManualCorrect is a completely FREE tweak. If you are also a fan of the tweak, or are starting to become one, you will be glad to know that the developer behind ManualCorrect has decided to make his tweak even better by creating a pro version! In this new and Improved version of ManualCorrect you can apply custom correction settings, punctuation corrections, and enable a convenient SBSettings toggle. All settings that inevitably really complete this already useful tweak. 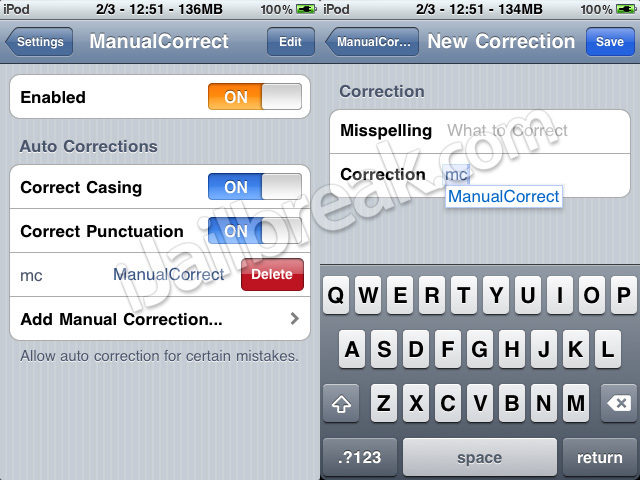 If your interested in ManualCorrect Pro you can find it through the Cydia Store for a price of $0.99.